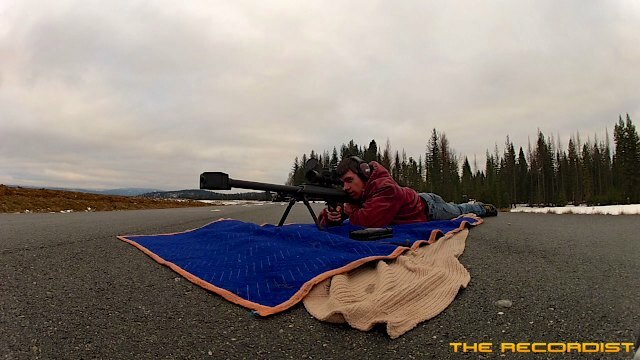 First off, I recorded a bunch of other guns that day before getting to the 50 BMG. 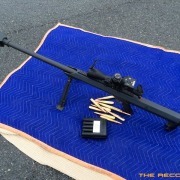 For the other guns, which I can say were “much smaller” in comparison to the 50 BMG I had the microphones set up in a smaller and tighter radius. 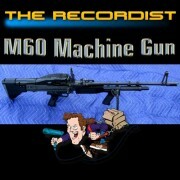 So, after moving all the microphones further away from the shooting location I was ready to begin recording this beast. 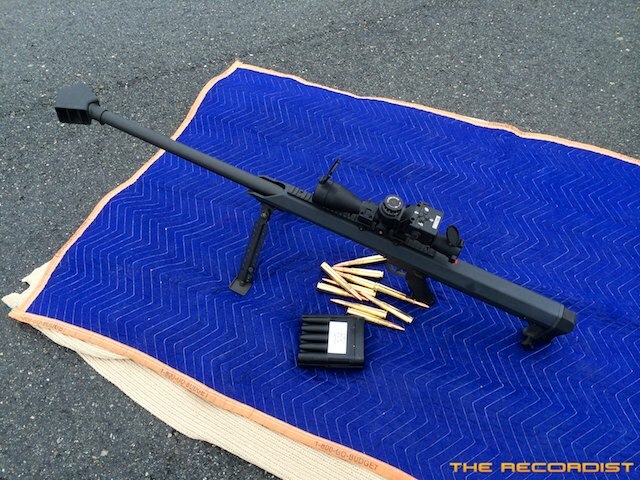 I was not sure exactly what I was going to get as test shooting the 50 BMG is expensive. So I just dived right in and went for it. 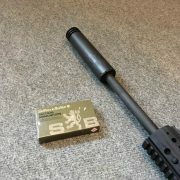 The ammunition costs quite a bit and is very difficult to get these days so I did not want to waste a single round. I recorded 8 channels of audio using a Sound Devices 744T and two 702 recorders. 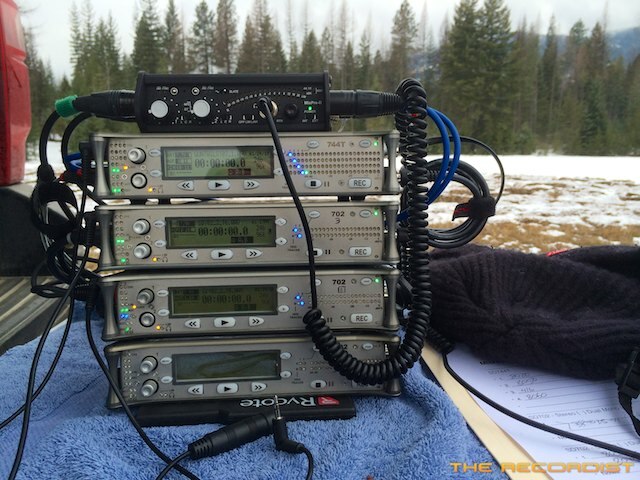 Feeding the recorders were (4) Sennheiser MKH-8040’s, MKH-8050, MKH-8060, MKH-8020 and a MKH-416. The MKH-8040’s were set up in 2 pairs, a stereo XY and a stereo spaced pair. The spaced pair of MKH-8040’s were very far apart but equal distance and angle to the center shooting location. This is a new technique I was trying out and am very happy with the results as they can also be used as 2 mono tracks that can be mixed in mono or panned left-right and any width. 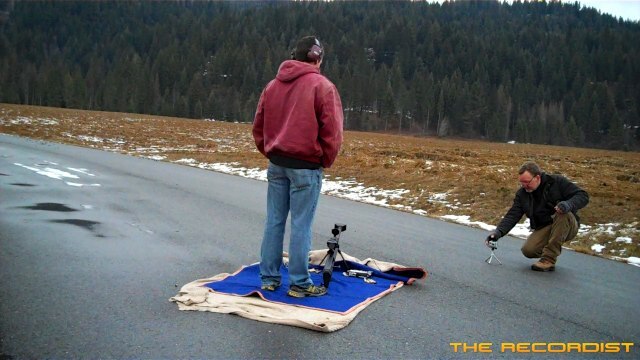 The spaced pair were 25 meters from the shooter set back and angled slightly inward. 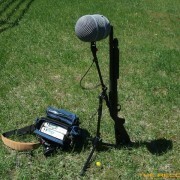 The MKH-8040ST XY set was set 30 meters directly behind the shooter. The MKH-8050 and MKH-8020 were in my ORTF mount with the MKH-8050 pointed toward the gun on the left side of the shooter and 20 meters or so away which left the MKH-8020 looking away from the shooter. 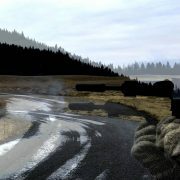 The MKH-416 was 15 meters behind the shooter set slightly to the right side and the MKH-8060 set to the right side aligned with the muzzle at 35 meters away. In a word: very nice. IMHO. 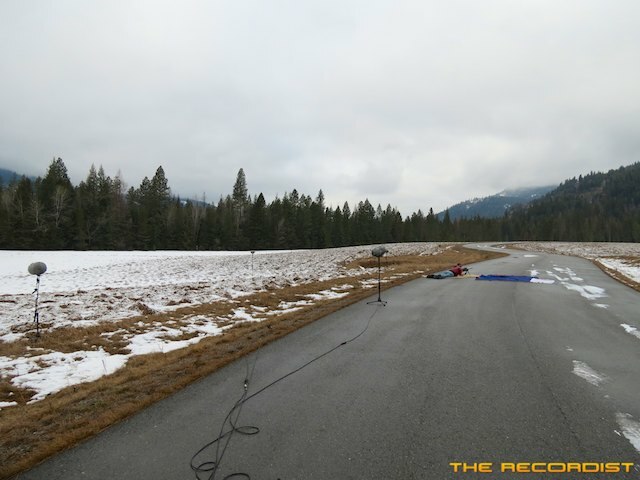 Below is a audio demonstration featuring one recorded shot taken from all the Sennheiser MKH-8000 Series microphone rigs and my trusty MKH-416. The first shot is the XY setup and the second shot is the wide spaced pair. The difference in stereo width is very apparent given they are two totally different techniques. The other microphones play in this order: MKH-8020, MKH-8050, MKH-8060, MKH-416. If you listen closely you can hear the projectile impact the steep hillside which was a quarter mile away. 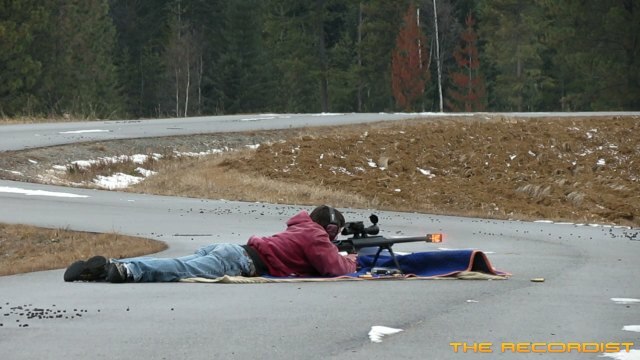 I was most thrilled with the wide spaced pair at this ranch location because of the crazy echo generated by the 50 BMG. It also has quite a beefy “whomp” to it. The demonstration audio files were processed with EQ and some heavy limiting. For the EQ I rolled off at 16Hz and added a slight 2dB bump at 8kHz with a wide Q setting. The limiting was, how can I say this, “substantial” yes, that’s the word. I hit it fairly hard to make the beautiful echo stand out. I just have to say the Sennheiser MKH-8040 microphone rigs never let me down. The gun is loud, but not as loud as I thought it was going to be. Maybe it was the air density or the cold/cloudy skies or just the wide open location that made it seem quieter than I was expecting. 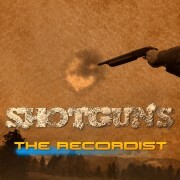 Even though I was very far away from the gun with the recording gear I could still feel the gun shockwave hit my body really hard. Don’t get me wrong, it was still very, very loud. This gun is a “beast” to fire my shooter informed me. He also informed me that after the first shot he could feel the brute force of the air and smoke go into his nose at the moment of shooting but the shockwave was not that bad where he was. Wait, wait, wait for the train to pass… and that big rig. Yep. Even though we were at a wonderfully quiet location with no wind that day, occasionally we could hear a train in the distance or a large semi-truck heading up to Canada on the state highway with it’s wheels “humming”. Though this did not happen very much but sometimes just as we were about to record we had to stop for a distant train horn. Should I mention the mating Ravens flying overhead? Nah. 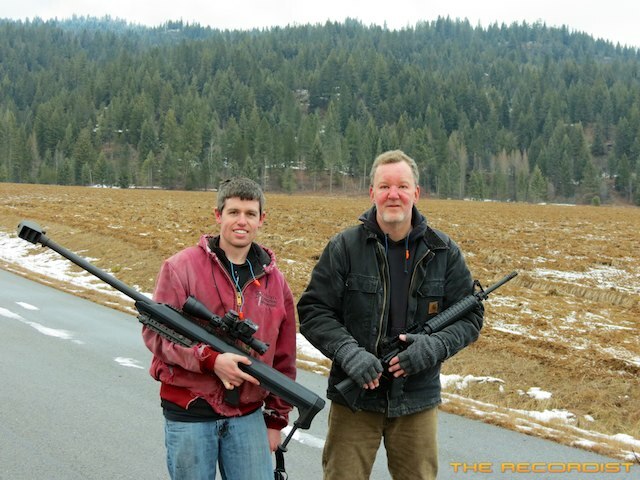 Special thanks to: Richard & Doug Harlicker from Wrenco Arms… and Fred. All images and sounds Copyright 2014 Frank Bry – Creative Sound Design, LLC. All Rights Reserved.